« For Earth Day: Love the natives; hate the invaders. 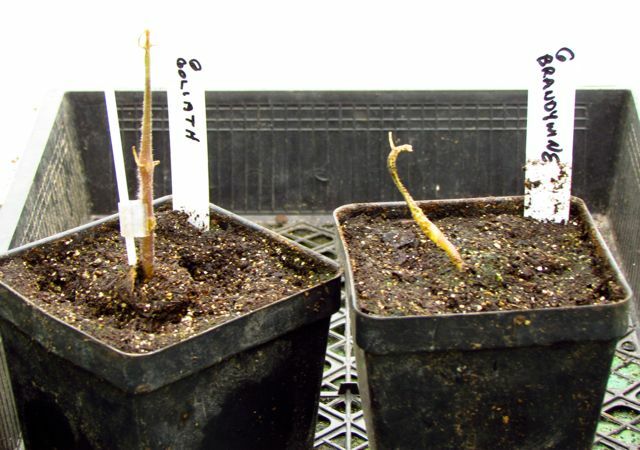 Status of same varieties of seedling and grafted plants on the day the grafted ones arrived on 4-25-13. I’ve never had newly delivered plants look this bad — including the ones I once ordered from Canada. If you click on the above photo to enlarge it, you’ll see that the plant on the right was broken when I opened the box. 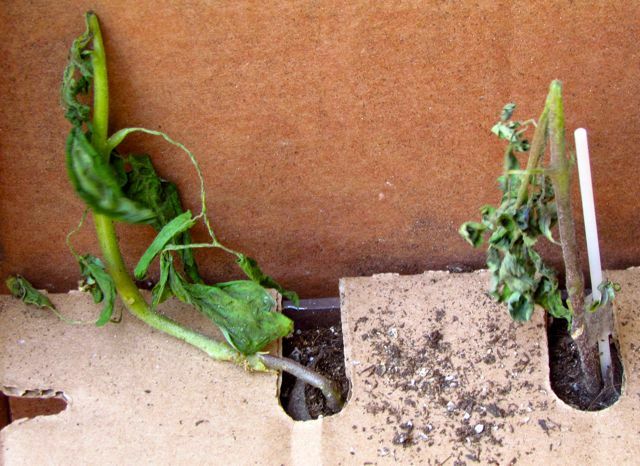 The leaves of the plant on the left — although they look a bit greener — are also wilted beyond recovery. Why? The soil in their little pots was Dust Bowl dry. No moisture at all. This is one of those times when I let my enthusiasm for cutting-edge plants push me past careful reasoning. 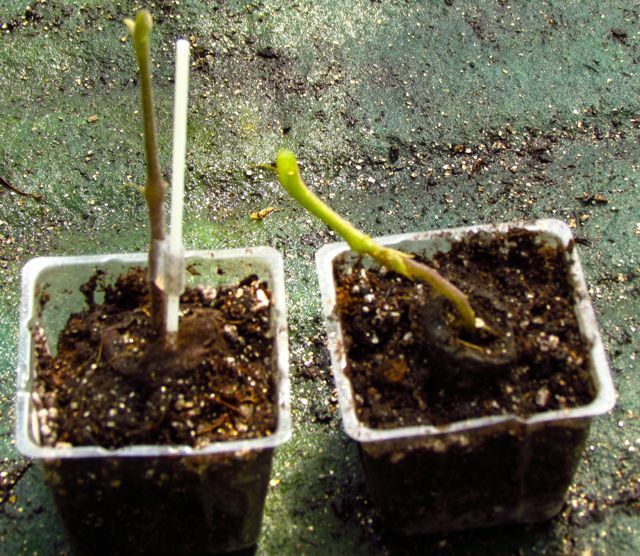 As I mentioned in my first post about this back in January, gardening magazines and catalogs have been full of buzz about the benefits of growing grafted vegetables. I didn’t really buy the hype, but I was curious, which is why I decided to try growing the same varieties of grafted and seedling tomatoes to see for myself. But I didn’t research carefully. I impulsively ordered my grafted plants from the same company where I order my tomato and pepper seeds. Seeds from this company always give me near-100% germination and yield consistently healthy, productive plants, so I assumed they’d deliver similar quality in their grafted plants. What I didn’t know — because I didn’t ask — is that my tomato seed company does not produce the grafted tomatoes themselves. They buy them from a wholesale nursery that, I gather, has patented a line of grafted vegetables, which they produce and sell to retailers. There’s nothing intrinsically wrong with this model, if all parties plan carefully to compensate for the travails of shipping tender summer vegetables across North America. However, if the plants I received are any indication, careful shipping was not part of the plan. The company I order my tomato seeds from is in Wisconsin — an area where winter cold remains abundant. And from the insert with my grafted plants, I learned that the wholesale nursery that provided the grafted plants is in Oregon. Neither of these locations is, of course, near my location in North Carolina. And our growing seasons are not the same by a long shot. If I had thought about this more carefully, I would have realized that it was not likely that a company in Wisconsin could ship me healthy tomato plants in time for me to plant them out with the rest of my summer garden. In my defense, I did realize that the plants I received would probably be smaller than my seedlings, and I planned to account for that in my field trial. But I needed live plants to make that work. 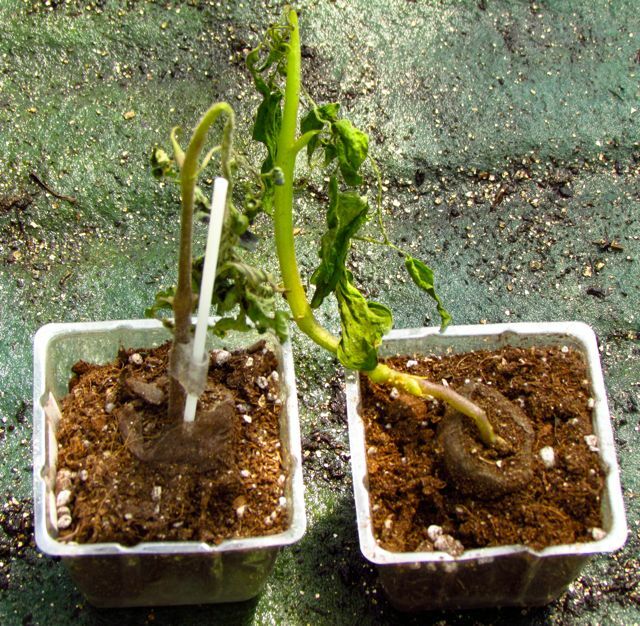 As soon as I received my dying grafted tomato plants, I called the company that sold them to me. A very nice lady there asked me if the grafts were intact and the stems were still green. They were. She then instructed me to cut off all the dead/dying leaves, water and feed the plants in their pots, and put them in the sun. I confess I laughed out loud at these instructions. So I followed her instructions. I cut off all the dead/dying leaves, transplanted the sad little stubs to slightly larger pots, and drenched them thoroughly with the fish emulsion/seaweed mix that I administer to all my seedlings. The company had provided a packet of commercial, non-organic, very potent fertilizer (20-20-20) that I was supposed to mix with water and use, but this would have ruined my little test by not using the same fertilizer, and I’m an organic gardener. Also, I think throwing that potent a chemical fertilizer onto deeply stressed plants is more torture than first aid. The soil was completely dry. This is what they looked like four days later. 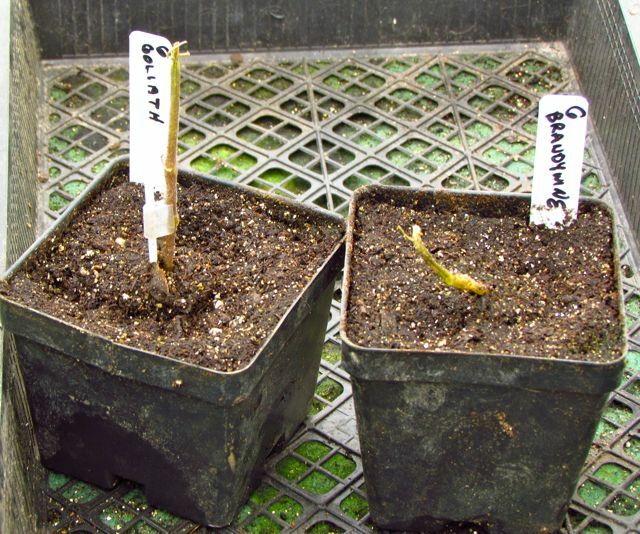 I think it highly unlikely that these sad brown stubs will sprout new leaves, but I’ll leave them in the greenhouse another week before I give them a decent burial in the compost pile. I imagine the folks from whom I ordered my plants would offer to send me new plants if I asked, but there’s really no point now. My seed-grown plants are ready for transplanting as soon as our uncharacteristically chilly weather pattern finally breaks down next week. If folks from the wholesale nursery or the tomato seed company want to respond to this post, I’ll be happy to publish their responses. I’ve made every effort to represent their processes accurately, but if I’ve erred in a supposition somewhere, I’ll be happy to correct it. Bottom line: I let my enthusiasm for a new plant fad overpower my years of gardening experience. It would have been interesting to see how grafted plants perform, but my seed-grown plants provide all the produce I need every year anyway. If I discover a local source for healthy grafted vegetables, I might try one some time just to satisfy my curiosity. But I am blessed with rich garden loam, a long growing season, and healthy seed-grown transplants. New-fangled grafted veggies can’t possibly compete with all that. 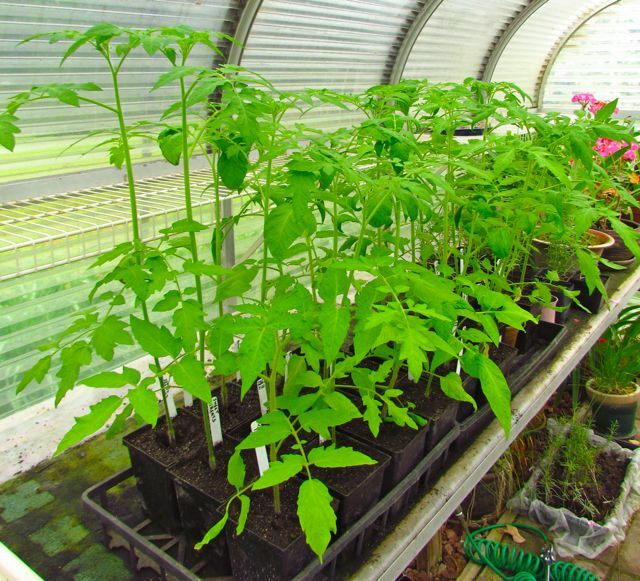 Seed-grown tomatoes are ready for transplanting as soon as our weather moderates. 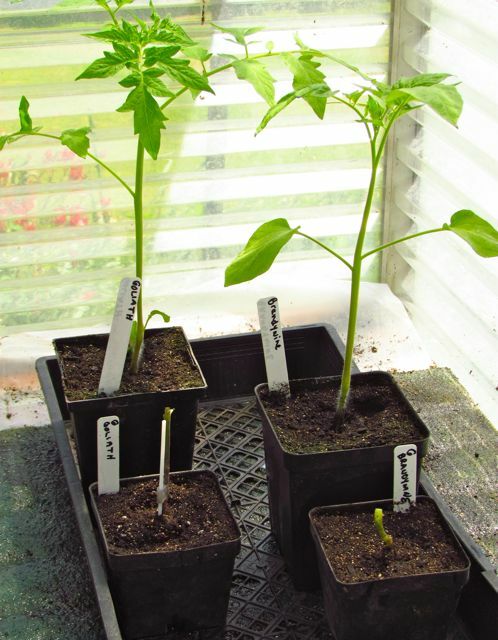 This entry was posted on May 1, 2013, 11:37 am and is filed under Greenhouse growing, piedmont gardening, Vegetable Gardening. You can follow any responses to this entry through RSS 2.0. You can skip to the end and leave a response. Pinging is currently not allowed. Your green thumb is better than anything. Thanks for your vote of confidence, Jerree!